You must install the version of X-Pack that matches the version of each product. For more information about product compatibility, see the Elastic Support Matrix. The X-Pack installation scripts require direct internet access to download and install X-Pack. If your servers don’t have internet access, you can manually download the X-Pack zip file and transfer it to a temporary directory on the offline machines. The plugins for Elasticsearch, Kibana and Logstash are all included in a single zip file. For more information about installing X-Pack on offline machines, see the product-specific X-Pack installation instructions. By default, all X-Pack features are enabled. 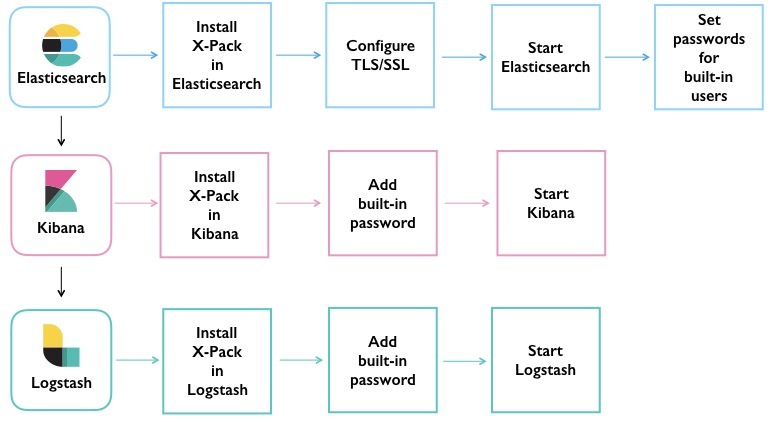 You can enable or disable specific X-Pack features in the elasticsearch.yml, kibana.yml, and logstash.yml configuration files. Set to false to disable X-Pack graph features. Set to false to disable X-Pack machine learning features. Set to false to disable X-Pack monitoring features. Set to false to disable X-Pack reporting features. Set to false to disable X-Pack security features. Set to false to disable Watcher. For more information about which settings exist in each configuration file, see X-Pack Settings.